I am so excited that we are collaborating with Avery Elle this month. Their designs are always fresh, and make me smile. And their quality is superb. I love getting a perfect impression the first time. I’m not a perfect stamper, so I need all the help I can get. This month’s challenge is Rainbow, and I used some new Distress stains to help me achieve my rainbow. I adore the ease of using distress stains, and if you don’t have any, I highly recommend trying some. This card was very easy. I stamped and clear embossed the images and sentiment first. Then swiped the distress stains over the images in rainbow order. In the end I ended up added a bit of grey distress stain at the bottom, so the cherries didn’t look like they were just floating. Cherries need something to stand on, right? Added some Wink of Stella to the girl cherry, mounted the watercolor paper onto a pool card base and the card is done. It makes me smile, and I hope the recipient also smiles when they receive it in the mail. Don’t forget to join us in this month’s challenge for your chance to win a prize from Avery Elle! Hi friends, it’s Michele. Welcome back to another collaboration with Avery Elle! We’re also working with rainbows this month, have you joined the fun? You can link up your creations HERE! I went a much more subtle route and used rainbow stripes and polka dots throughout my creation. I love making these gift sacks; they have two pockets – one at the very top, then one where the main image is, I folded up the bottom of the sack and sewed along 3 edges to create the lower pocket. You can add gift cards, necklaces, dainty/girly things – but I LOVE to add gift cards, that’s my favorite! 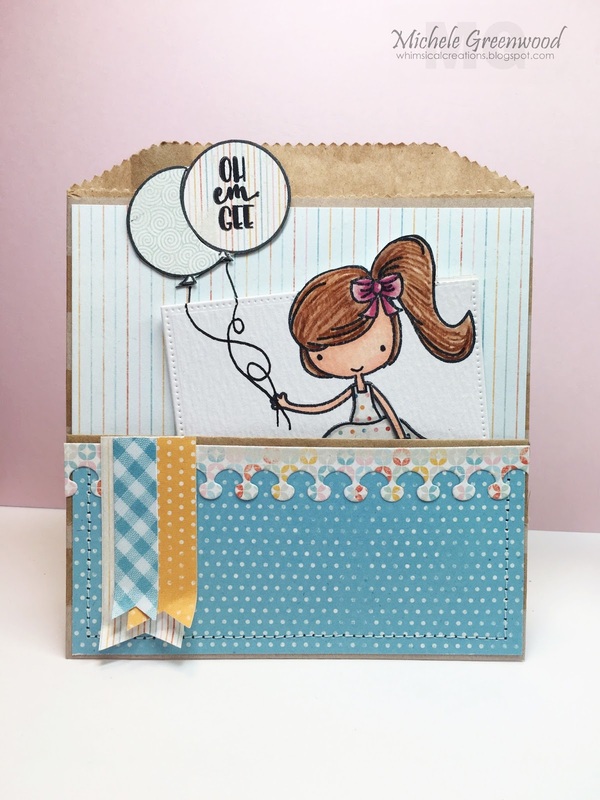 The focal point was partially die cut using a pierced square die; I cut another full square and adhered it to the back where you can write your message. Isn’t this girl the sweetest little thing? There are so many options in this stamp set, Skating By. 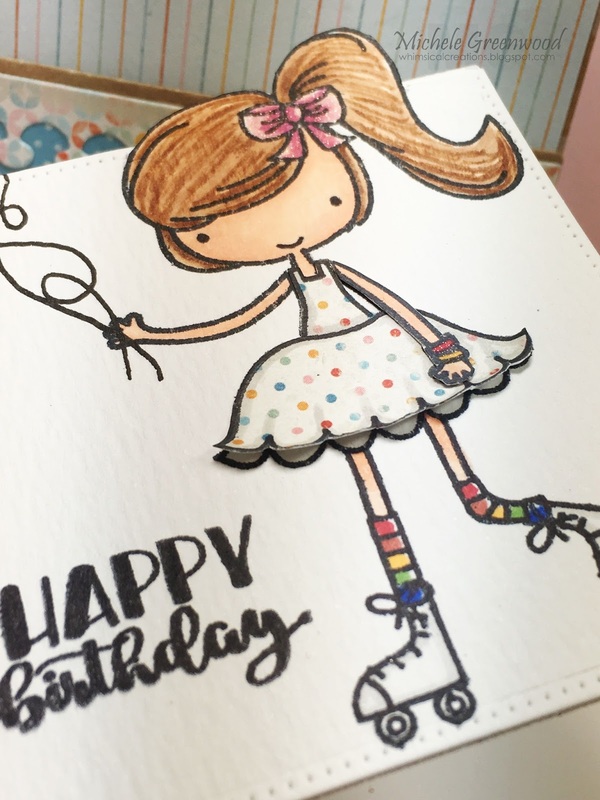 I paper pieced her dress, left the bottom part loose so you can turn it up; also paper pieced the balloons; I adhered the balloons totally separate and drew in the balloon strings. Once again I pulled out lots of designer paper scraps and ‘made it work’! 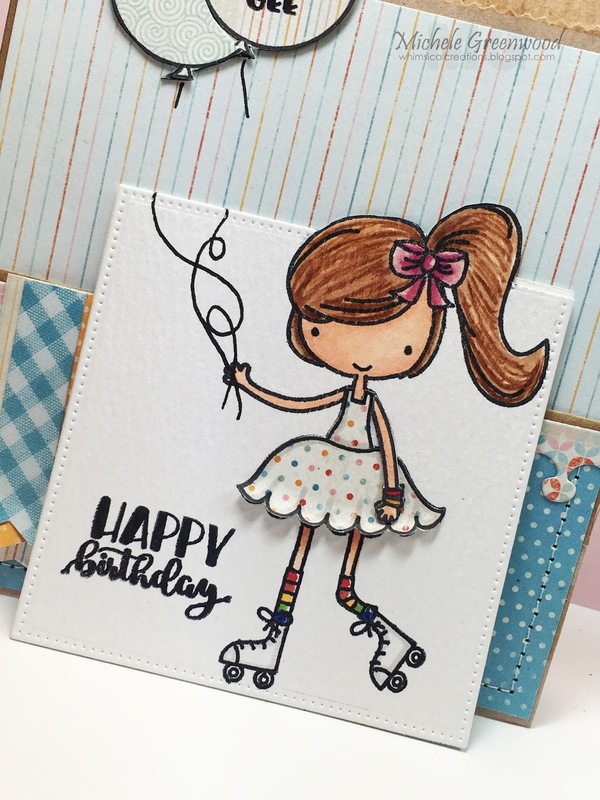 All images were stamped in Hero Arts black ink – I love the crispness of their black ink! Thanks for visiting; we can’t wait to see your RAINBOW creations. Have a great day! Hi Everyone! Kristina here today with my Avery Elle collaboration! A big Thank You to them for sharing some of their fabulous stamps with us this month. it down to a more pastel shade of each color, and ouline the whole thing in gold. 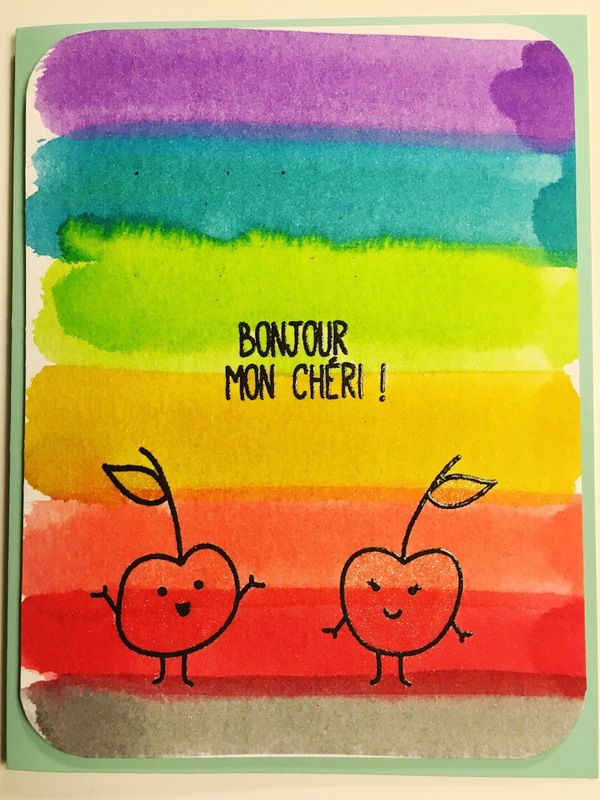 I hope you’ll join us for our Rainbow challenge this month! You have a chance at a prize from our Awesome collaboration partner & sponsor, Avery Elle!!! The card I made was super fun to make. And even though it took me a couple of tries, I love the way it turned out.